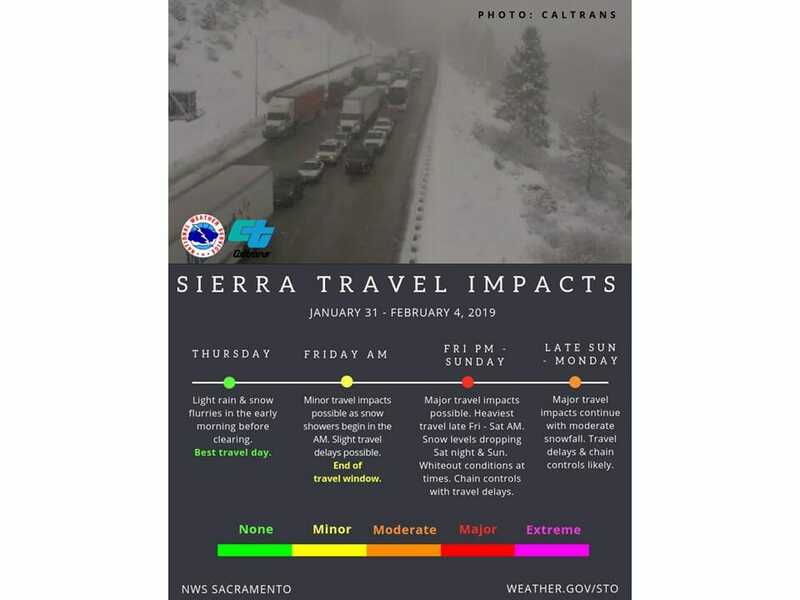 January 30, 2019 – Light precipitation possible coast range today then most areas Thursday. 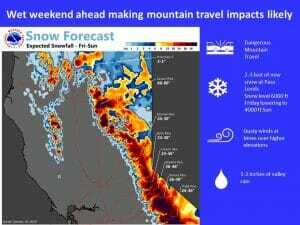 Wet weather expected Friday through the weekend, with the potential for significant mountain snow. 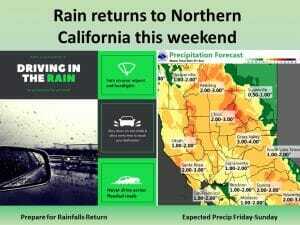 Central valley thunderstorms possible Saturday. Small scale high pressure ridging bringing dry conditions over the CWA this morning with just some high cloud cover spilling over the ridge into NorCal. Some light fog has formed in the central valley with some locally dense fog in the Davis area but with cloud cover, widespread dense fog is unlikely. 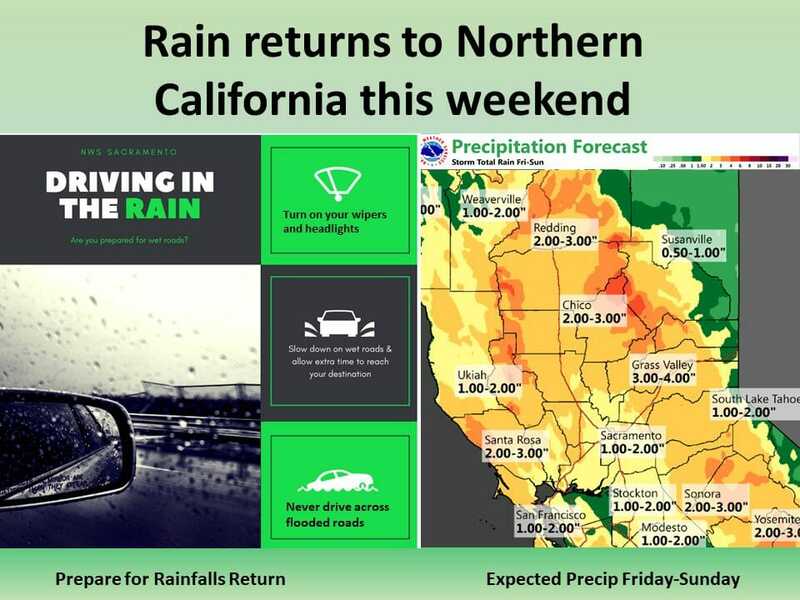 An upper low off the NorCal coast will move eastward enough today to bring a threat of light rain the coast range but with high snow levels and light precipitation amounts expected, impacts will be minimal. This upper low is forecast by models to drop southward down the coast over the last 24 hours then inland into SoCal on Thursday. Shortwaves rotating around the northern portions of the low will bring a threat of light precipitation to mainly the southern forecast area. The lows southerly track will keep significant precipitation south of the forecast area. Even with cloud cover today and Thursday, warm airmass will keep daytime highs above normal over the next couple of days. Thursday night should be mainly dry under brief upper ridging but cloud cover should keep valley fog light. Friday begins a change to a wetter pattern as a strong Pacific frontal system approaches the north coast. Surface and upper level pressure gradients ahead of the front will combine for breezy south winds as precipitation spreads over the north state. Models in good agreement in keeping the front off the coast through 00z Saturday so precipitation amounts should remain light on Friday. Only slight differences now in frontal timing moving across norcal Friday night bringing significant precipitation amounts. Snow levels expected to be between 5000 and 6000 feet Friday night so high enough to not impact coast range passes but low enough to impact the Sierra Cascade passes. 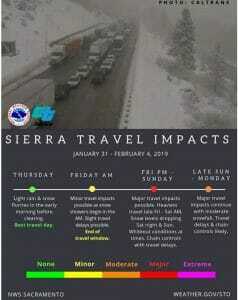 Therefore, Friday night is likely to see hazardous travel Trans-Sierra passes as heavy snow and gusty winds combine. Main cold front forecast to shift east of the forecast area during the day on Saturday with associated upper trough pushing through norcal during the afternoon. Steepening lapse rates with at least some surface heating in the central valley will bring a threat of isolated thunderstorms through the evening hours. 00z run of the GFS indicated negative surface LI`s all the way up the valley while 06z run reduced surface instability to the southern Sacramento valley. For now, have kept slight thunderstorm chances throughout the valley into the evening hours Saturday. Snow levels start to drop Saturday night going in to early next week as colder air begins filtering into the region. The third shortwave within the trio of Pacific systems will move through the region on Sunday. Unlike the preceding system, this feature is not quite as amplified which will favor somewhat lower precipitation amounts. Ensemble spread exists with the timing of the trough passage with 00Z GFS/GEFS members generally about 6 to 12 hours slower than the 00Z ECMWF solution. Thus, at this juncture, it remains difficult to pinpoint exact timing of precipitation and local mountain impacts. Based on the latest expected temperature profiles, snow levels should be lower with this system (4,000 feet). By Sunday night into Monday morning, these levels could drop to 3,000 feet potentially bringing light accumulations to the foothills. As this shortwave traverses the region, a powerful northern stream upper low drops down from the Pacific Northwest. While it will have limited access to moisture, the trough will bring much colder 850-500 mb temperatures down into Northern California. The 06Z/00Z GFS and 00Z ECMWF continue to differ with the strength of this surge. The 00Z ECMWF solution lowers 700-mb temperatures to the -15 to 19C range on Monday which would lead to some rather chilly mountain temperatures. High temperatures could remain stuck in the teens over the highest elevations. At this point not expecting any precipitation with this digging trough. Beyond Monday, a building ridge offshore will favor a shift to northwesterly flow across the state. This supports a movement toward drier weather through at least next Wednesday (Feb 6). However, this flattening ridge will be quick moving in response to the next Pacific system lurking offshore for next Thursday (Feb 7).